David Yowney, "Terwillegar Park Forest Pathway", acrylic and graphite on linen, 36" x 24"
Yowney says of his work: I interpret the meaning and significance of the river valley as a place relative to its position the city and the globe, so I used graphite rubbings to yield a physical record of a real place I experienced. I chose rubbings to highlight a new non-destructive way and renewable experiences of nature that may be accessed without altering it for the next person on the trail. This picture is a rubbing of a foot pathway deep in the Terwillegar Park Forest. This painting symbolizes how nature is left to it natural cycles within the city where, on the soil, roots grow, leaves and twigs fall and nature is undisturbed. 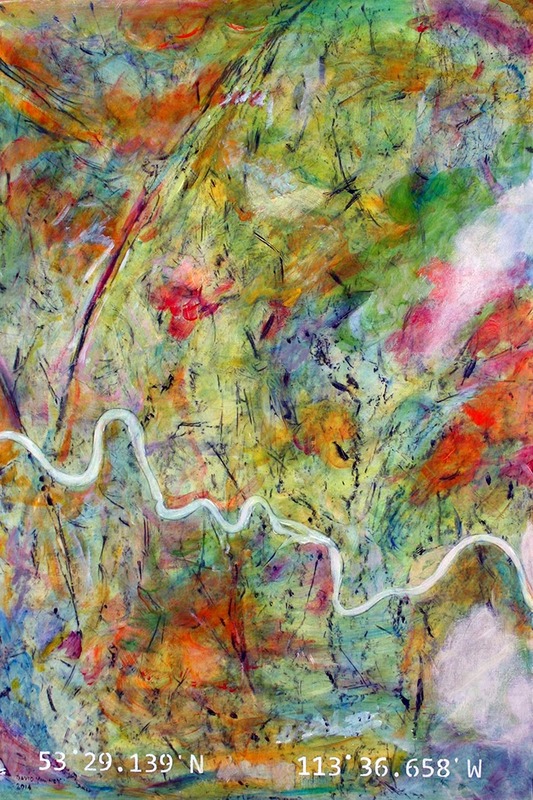 The GPS coordinates; the rubbing and the satellite views signify that viewers may access the river valley project on the Internet. The global community can study the source of the artwork from anywhere in the world and see a higher level of meaning as I marked how cooperation has grown with this unique pathway.